Hello! As you might guess by the heading, my name is Greg, and I live in Bloomfield, New Mexico. This web site is an assignment for one of my college classes, and I'm supposed to tell you a little about myself. I can't guarantee that it will make riveting reading, but in case you suffer from insomnia, it could be what the doctor ordered. Read it twice and call me in the morning! 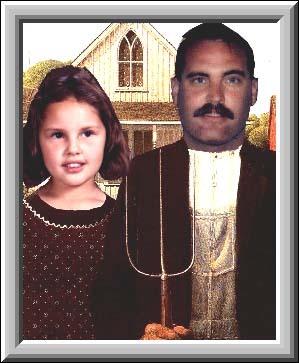 I'm the one with the pitchfork and the little one is my daughter Jordan. Just start visiting links and you'll be asleep before you know it.